Before the smoke tube got available most people used a smoker box. The bad part was that those used op a lot of space in your smoker. the tubes take up less space and because of their shape burn very long. 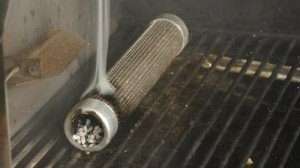 At first when I started to look at pellet tube smokers to review I found that there are a lot of people use them on their pellet smokers. There are also many people who use them on their regular smoker and use only charcoal for the temperature and a tube smoker for getting the smoke flavor. Another type of user use them for cold smoking and that is getting pretty popular, so we have to write about that in an other post. Since the Amazen pellet tube smoker is very popular we will start with reviewing them first. If you are more interested in using wood chips for smoking you can read our post on that by clicking on that link to read our in depth post about using wood chips for smoking.